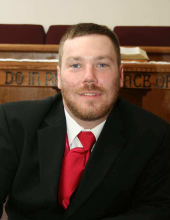 Floyd Allen Reynolds III, 37 of Neodesha, Kansas died Sunday July 8, 2018 from injuries sustained in an automobile accident. Floyd Allen Reynolds III was born July 22, 1980 in Wichita, Kansas the son of Floyd Allen Reynolds II and Rhonda (Edwards) Reynolds. He grew up in and attended schools Wichita and Neodesha. On July 11, 2009 in Neodesha he was united in marriage to Kendra Bennett and she survives at the home in Neodesha. He enjoyed fishing, hunting, video games and being with his family. He will be remembered for his sense of humor and loved the Carolina Panthers NFL football team. Floyd had plans to go to college to become a psychologist to helps teens like his daughter Bree. He had worked as a manager at the Parsons Walmart. Survivors include his wife Kendra of the home, father, Floyd Allen Reynolds II and his wife Hoa of Wichita, Kansas, mother, Rhonda Daffron and her husband Don of Fredonia, Kansas, children, Floyd Reynolds IV, Carson Leck, Ashley Reynolds, Joseph Reynolds, Mayzie Reynolds, Nova Reynolds, brothers, Jacob Daffron of Fredonia, Kansas, Jeremiah Daffron and his wife Jenny of Wichita, Kansas, grandmother, Ramona Hughes and grandfather, Junior Edwards. He was preceded in death by his daughter, Bree Reynolds and grandfather, Floyd Reynolds. Celebration of Life Funeral Services will be held 11:00 A.M., Saturday, July 14, 2018 at Grace Baptist Church, Neodesha, Kansas. Private family inurnment will follow at a later date. Services are under the guidance of Wickham Family Funeral Home, 510 North 7th, Fredonia, Kansas. To send flowers or a remembrance gift to the family of Floyd Allen Reynolds III, please visit our Tribute Store. "Email Address" would like to share the life celebration of Floyd Allen Reynolds III. Click on the "link" to go to share a favorite memory or leave a condolence message for the family.